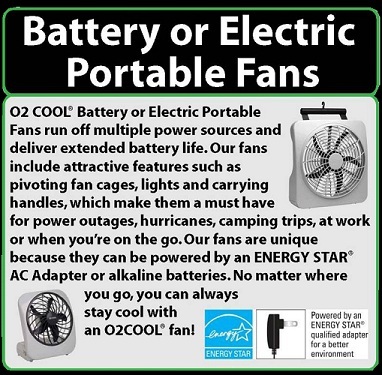 The O2 Cool 10" Smart Power Rechargeable Fan features two different speed settings and is ideal for both outdoors activities and indoor events. The fan also comes in handy during power outages and other emergency situations. If you are looking for 1 fan that can be used in any setting, this is it! Great to use in your home or office, and perfect for outdoor events and camping too! 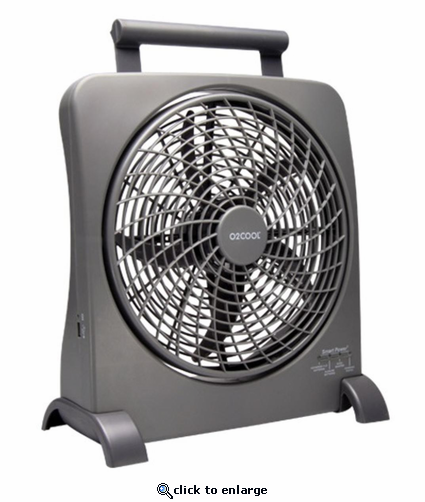 This great 10-inch swivel fan epitomizes powerful performance and convenient portability. It also offers flip-up hook and handle for adjustable storage and placement. An indicator light signals a low battery warning for the built-in batteries. Smart Power technology: Fan automatically selects lowest cost power option. This portable cooling fan stays relatively quiet at variable speeds. The fan integrates Smart Power Technology, which enables it to run on four different power sources - on an AC adapter, car-charger adapter, D cell batteries (eight), and on the built-in NiMH rechargeable batteries. The swivel fan offers a pivoting fan cage for directional airflow. Dimensions: Stands: 13 1/2"H x 11 3/4"W x 5 3/4"D. Folded: 13 1/2"L x 11 3/4" W x 3"D.
What power sources Does this fan USE? : The Smart Power fan selects the lowest cost energy option. It selects the AC or DC adapter first, the rechargeable batteries second and the 8-D alkaline batteries third. How long does it take to charge the fan? : The charging time is based on the level of charge left in the batteries and whether or not the fan is in use during the charge cycle. We recommend that you monitor the indicator lights to determine when the unit is fully charged. How do I charge the fan? : Switch fan to \xF1OFF\xEE, connect the AC or car adapter to the fan, then plug the adapter into an electrical outlet or the car adapter into the car power outlet. Slide switch to one of these positions: HIGH, LOW, or STOP. It\xCDs necessary to begin the sequence in the OFF position to reset the Smart Power\xAC controller. What should I do before I store my fan? : Prior to storage, fully charge the rechargeable batteries. Store the fan with all plugs removed and the slide switch in the OFF position. How long will the rechargeable batteries last? : The rechargeable batteries can operate the fan up to 5 hours under typical use and can be re-charged up to 500 times. Can you recharge the batteries with a car adapter? : Yes. It takes the same amount of time to charge as it would using the wall adapter. The charge light won\xCDt stop blinking, and it HAS been over 24 hours. : Turn the fan on to see if it is working. If so, there might have been a malfunction in the light switch. If the fan still does not work, the rechargeable batteries have exhausted their useful life and the fan will need to be operated with other power sources. Can rechargeable batteries be replaced? : No. You cannot replace the rechargeable batteries built into the fan. I cannot see the rechargeable batteries. Where are they? : You cannot see the rechargeable batteries because they are built in. How do I dispose of the rechargeable batteries? : The batteries can be taken in a recycling station found at most electronic retailers. Bought this for outdoor archery tournaments! We compete in the heat of the summer, and I saw someone had one of these, thought it was a great idea...so I bought one, and really it has proven to be really good. Overnight charge will do the whole day! Highly recommend this product! ProsWireless...has a built in rechargeable battery! Impressive air circulation.